1. 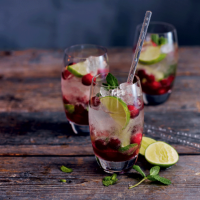 Put the cranberry sauce, rum or vodka, juice of ½ lime and mint leaves into a glass tumbler, and stir well. Fill with some crushed ice and add the frozen cranberries. Top up with the sparkling water. Garnish with fresh mint leaves and the remaining lime, sliced.